Galaxy Note 8: How to register Iris for Iris recognition on lock screen? The device can save the iris data of one person only. You cannot register more than one set of irises. 1 On the Apps screen, tap Settings. 2 Tap Lock screen and security. 4 To use iris recognition securely, you need to set a pattern ,PIN, or password. Remember it, as you will need it to unlock your phone after it restarts or when it hasn’t been used for more than 24 hours. 5 Before using the iris recognition camera and LED, read disclaimer and keep the precautions in mind. Then, tap OK.
6 Read the on-screen instructions and tap CONTINUE. To register only one iris of your eyes, tap You can choose to register only 1 iris. 7 Now, hold your device 25~35cm away from your face with the screen facing towards you and position your eyes in the circles shown on the screen. 8 Keep your eyes open fully and look at the top of the screen. Iris recognition may not work properly in direct sunlight. For best results, avoid direct sunlight and perform this process indoors. And, keep the camera clean as dirt and debris on the iris camera, LED sensor, or proximity sensor may cause the device to have difficulty recognizing your irises. Position your eyes inside the circles on the screen and open your eyes wide. The iris recognition camera will scan your irises. 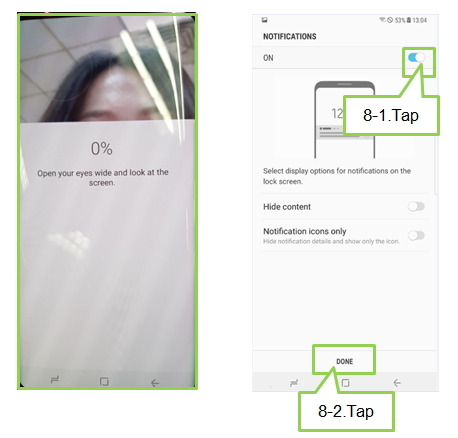 9 When an iris lock pop-up window appears, tap ENABLE to use your irises to unlock the screen and tap DONE. 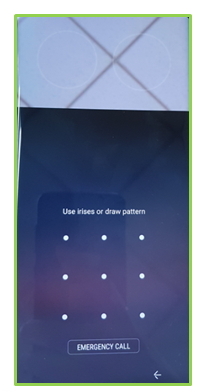 10 When you swipe in any direction on the locked screen, the iris recognition screen will appear. Look at the screen to scan your irises. If your iris is not recognized within 10 seconds or you are close to it, the device will automatically stop iris recognition to protect your eyes. If your irises are not recognized, unlock the device using the pattern, PIN, or password you set when registering the irises, and then re-register your irises. If your pattern, PIN, or password is forgotten, you will not be able to use the device if you do not reset it. Samsung is not responsible for any data loss or inconvenience caused by forgotten unlock codes.